The rates below are per trip. Aquarius can handle up to six fishermen safely and comfortably. We provide all tackle and gear you'll need for an outstanding day of fishing. Aquarius is docked in Barnstable Harbor. Because of its depth and configuration, we can head out any time we like regardless of the tides. There's plenty of free parking just feet from the boat. Take exit 6 off of Route 6. At the bottom of the exit ramp, turn onto Route 132 toward Hyannis. At the third set of lights turn left (onto Phinney's Lane). Continue on Phinney's Lane through the two sets of lights. After going through the second set of lights, the harbor is less than a 1/4 mile ahead. Click here for current weather details as well as the seven day forecast. Click here for current traffic conditions on Cape Cod, the Sagamore and Bourne Bridges. Although Barnstable Harbor affords us the ability to depart on any and all tides, click here to see a current tide chart. 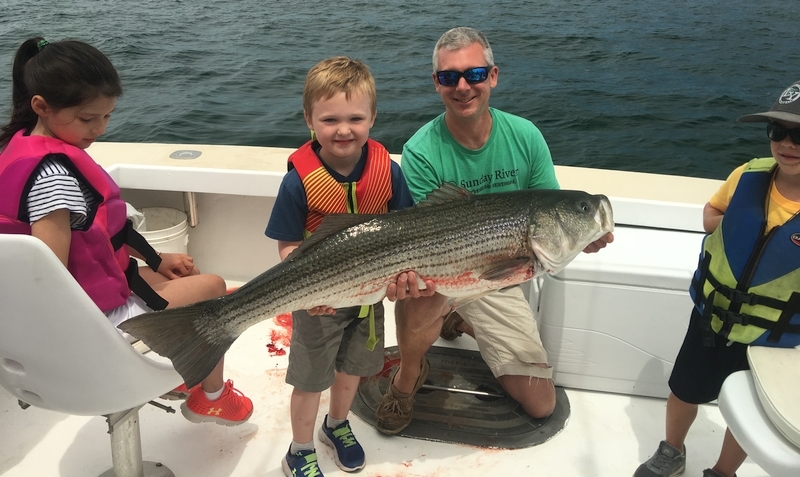 Book Your Cape Cod Fishing Charter Today!